* why trying to be smaller her whole life has kept her unhappy * how she realized her goal weight was not her final destination * how she stopped acting like a robot and learned to let go of what she thought she should be * and more! 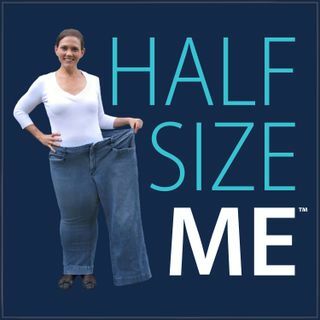 JOIN The Half Size Me™ Community waiting list! Learn more about the benefits of community membership and get notified when we open again for new members. The ... See More Half Size Me™ Show is a weekly podcast meant to inspire you and motivate you no matter where you are in your weight loss journey. If you're just getting started losing weight, or if you've started and stopped so many times you've lost count, this is the show for you! Hosted by Heather Robertson, who lost over 170 pounds by learning new eating habits, getting regular exercise, and, most importantly, changing her mindset. She shares her own lessons and struggles as well as how to handle to real challenge of any weight loss journey… weight maintenance. So, join Heather every week as she shares information, inspiration, and interviews with women who've learned weight loss isn't just about losing pounds, it's about finding yourself. Disclaimer: Heather is not a doctor, nurse, or certified health professional and what works for her or her guests may, or may not, work for you. So, please be sure to talk with your doctor, dietician, or other certified health professionals when seeking advice about your own weight loss or weight maintenance plan. All information included in The Half Size Me™ Podcast and on HalfSizeMe.com is for informational and inspirational purposes only. For additional disclaimer information, please visit HalfSizeMe.com. To contact Heather about the show, please click here to use the contact form.